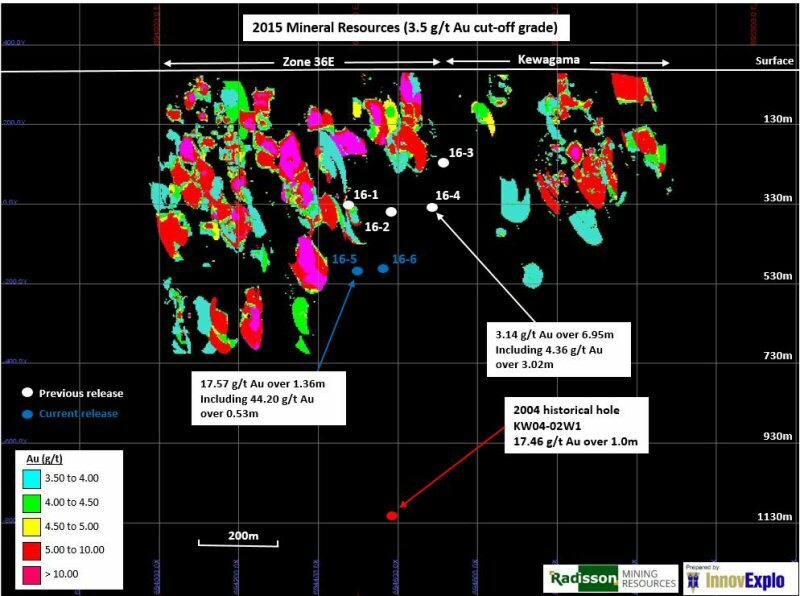 Radisson Mining Resources Inc. ("Radisson") is pleased to announce assay results from last two holes of first phase (Figure 1) of its 6,200 metres drill program at the O'Brien gold project located in the heart of the Bousquet-Cadillac mining camp along the Abitibi Greenstone Belt. 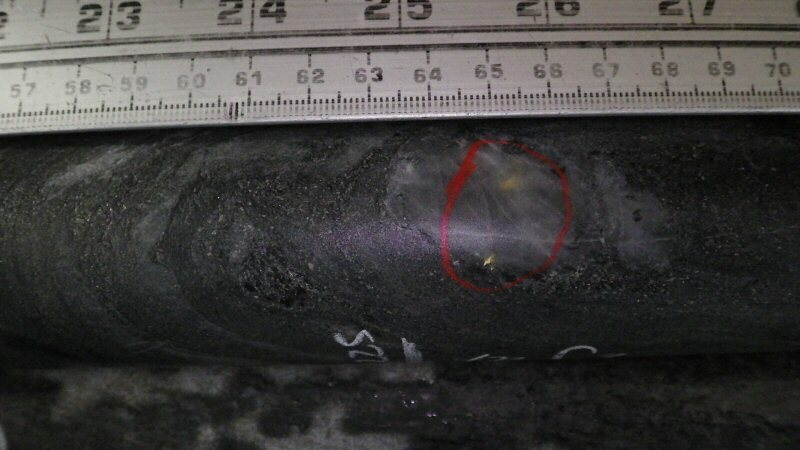 Drill hole 16-5 (OSP4-4) also intersected 10.94 g/t Au over 0.60m in the Pontiac Group sedimentary rocks (Figure 2). During second week of June a drill rig will be mobilized at the O'Brien gold project to complete an additional 3,400 metres of drilling. Radisson's President Mario Bouchard adds: " The team is delighted with the results obtained in extension of ore shoots within current mineral resources for this first phase of the drill program. The presence of high-grade mineralisation within volcanic rocks of the Piché Group underlines the potential to increase resources in this area. The new high-grade intersections in Pontiac Group sedimentary rocks came as a surprise. In future works, we will give particular attention to sediments were we denote strong exploration potential that was not explored by the past. 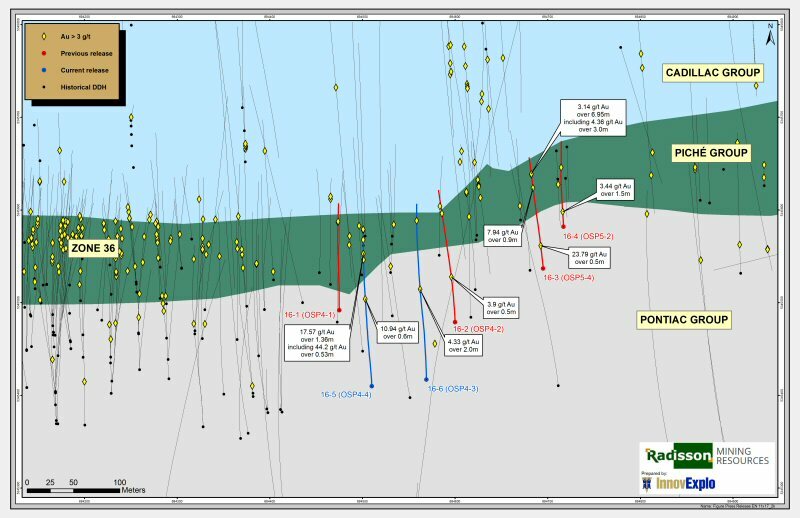 In parallel with drill program underway, we will revisit historical drill holes that intersected Pontiac Group Sedimentary rocks to obtain assays results and define additional targets. With only 2,773m of drilling the corporation intersected an impressive number of high-grade intersections. These results reveal in part the jewel that the corporation owns at 100%. We are excited to carry on exploration work and feel that they will generate plus-value for our shareholders". 44.20 g/t Au intersection is located within chlorite-carbonate schist characterized by the presence of sheared zone sometimes faulted. This schist is located within the Piché Group, more precisely within Southern volcanic rocks. Visible gold was observed in fine quartz veinlets with thickness smaller than five centimeter. Before reaching their target, all drill holes must cross Pontiac Group sedimentary rocks located south and outside current resource area. All drill cores in this campaign are NQ in size. Analyses were done on sawn half-cores, with the second half kept for future reference. The samples were analyzed using standard fire assay procedures with AA finish at Techni-Lab Actlabs in Ste-Germaine-Boulé in Abitibi, Quebec. Samples yielding a grade higher than 1 g/t were analyzed a second time by fire assay with gravimetric finish at the same laboratory. Assays containing visible gold and yielding a grade higher than 3 g/t were reanalyzed with metallic sieve procedure. Standard reference materials and blank samples were inserted prior to shipment for quality assurance and quality control (QA/QC) program. The corporation will hold it's shareholder's annual meeting in Rouyn-Noranda on June 3. The meeting will be held at the Best Western in the Raglan Room at 10 am. Radisson invites all shareholders to come to this meeting where it will present most recent corporate developments. Bruno Turcotte, Geo., M.Sc., acts as a Qualified Person as defined in National Instrument 43-101 and has reviewed and approved the technical information in this press release.